We were lucky to get a table – the place was nearly packed by noon rush hour. Service was pretty quick and the menu was pretty self-explanatory. 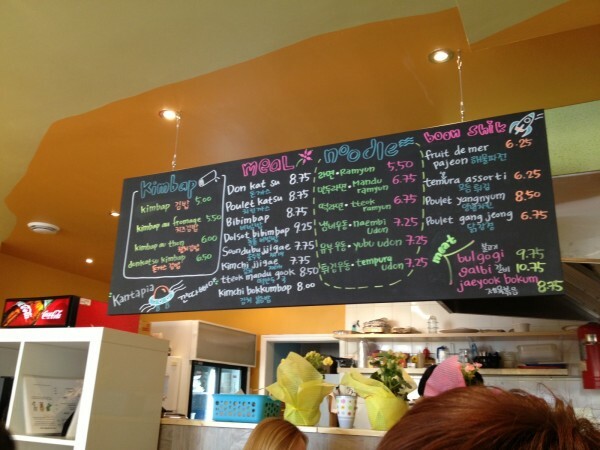 If you weren’t sure what was what, the servers seemed pretty friendly and willing to make the menu items a bit clearer. 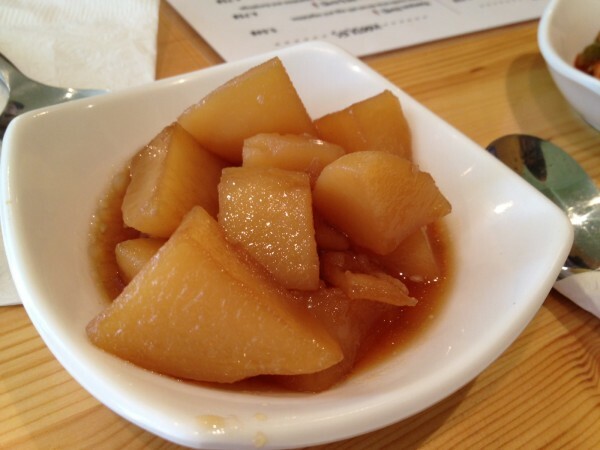 Soon after ordering, we were served some customary banchan – kimchi and cubes of soy sauce potatoes, both of which were pretty good. For me, the kimchi could have been a bit spicier, but everyone likes a different level of heat so it makes sense to err on the safer side. About twenty minutes later, we were all digging into our respective dishes. 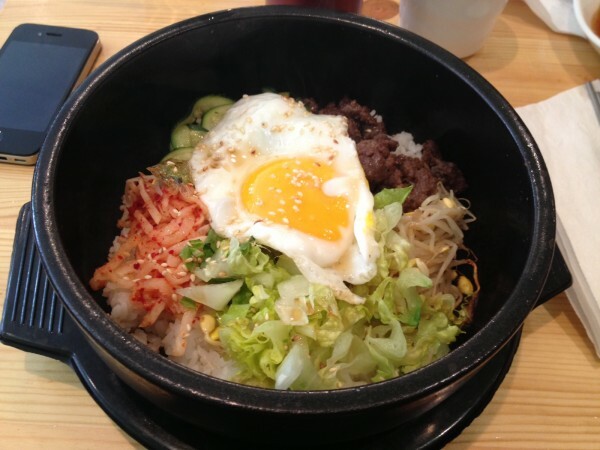 I had the dolsot bibimbap which came in the expected hot, stone bowl that made everything inside it sizzle and pop. Turning the contents of the bowl is important in order to get a nice crisp on the rice, the veggies and meat. Leaving anything in one place too long may more often than note result in burnt rice. Overall, pretty standard. Nice, easy dish to order and gobble up. Quite affordable too. 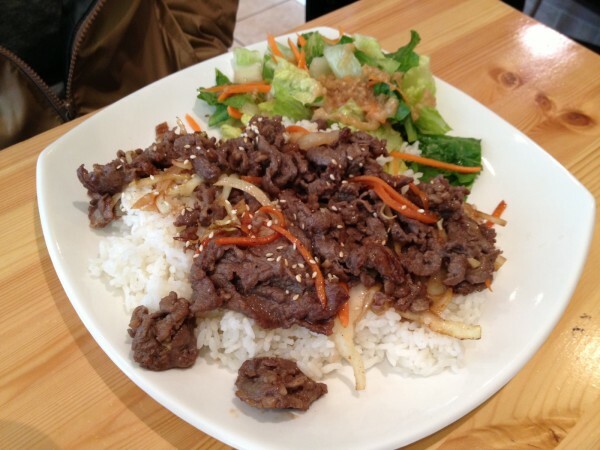 The bulgogi plate was pretty basic. Just some straight up marinated grilled beef with a sprinkling of sesame and julienned carrots on top of a pad of white rice accompanied by a little green salad. Not bad but not very memorable either. The kim tteok twi combo to me was kind of puzzling. No doubt that the Koreans have their own version of the Japanese sushi that originated during the Japanese rule in the early 20th century and that kimbap is it, but I can’t help but make a direct comparison to the real thing. With that mindset it was hard to appreciate the somewhat blander fillings of cucumber, egg and assorted veggies. 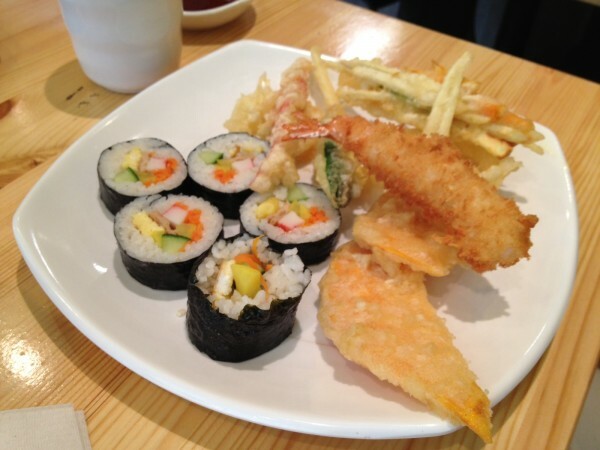 At the same time, the tempura wasn’t like tempura either, lacking the light crunch and the perfect fry. Overall a disappointing dish. 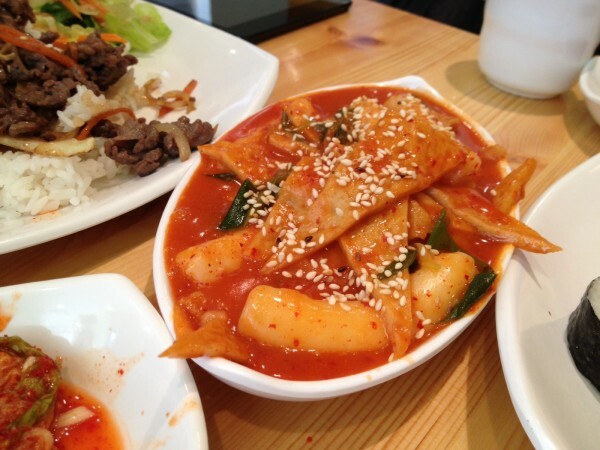 One of the redeeming factors though was the tteok bokki, which came with the kim tteok twi combo. Made with rice cakes, the rice triangles were soft, bouncy (literally, drop it on your plate and it will rebound slightly) and hard to pick up with chopsticks but definitely delicious. Kantapia has got the cute factor going on, that’s for sure. As for the food, it’s a decent feeding ground if you’re in the area around school or the office. Not the best, but not the worst. 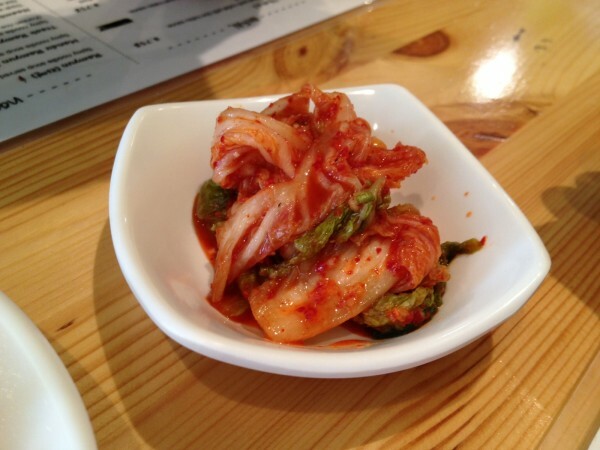 If you’re craving Korean and you’re downtown, you’ve got limited options. This is probably one of your best bets! 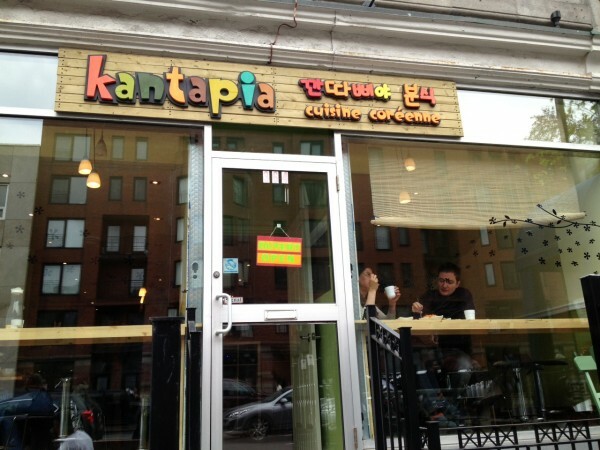 Tags: Banchan, Bibimbap, Bulgogi, Kantapia, Kimchi, Korean, Montreal, Rice Cake, Sherbrooke.